Late afternoon photo of the cliffside par 3 6th hole of the Bandon Dunes Course of the Bandon Dunes Golf Resort, Bandon, Oregon. 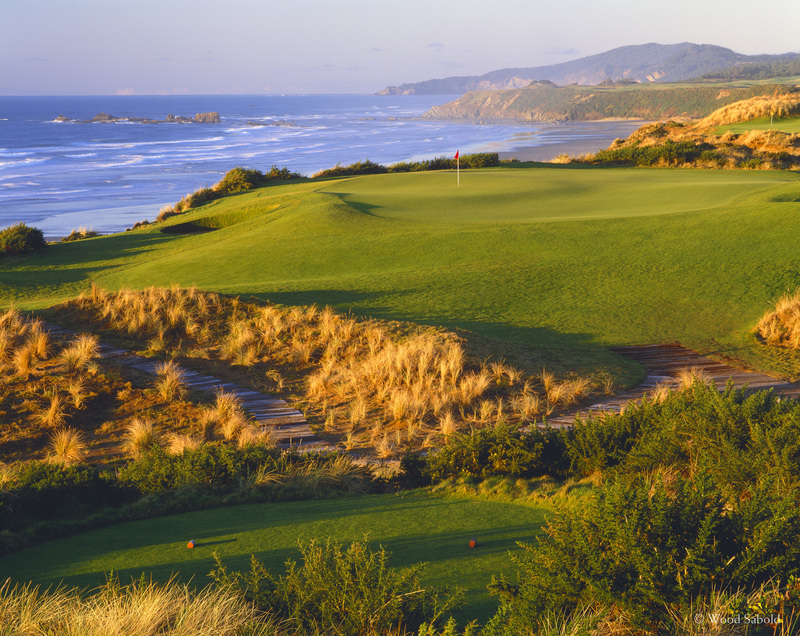 This view to the north includes a glimpse of the 11th hole of the Pacific Dunes Course to the far right. Offshore rocks and Cape Arago can be seen in the far north. Beach grass delineates the different tees. There are appropriate tees for every level of player on all holes of the course. The pathway material was ultimately changed to a combination of mulch and gravel. The Bandon Dunes Course was the first course of the Bandon Dunes Golf Resort. The course opened in 1999. Course architect, David McLay Kidd, DMK Design. This photo was taken in November of 2001. This is one of the most popular photos of the course. This is a telephoto view that shows the Pacific Ocean at it’s purist blue to the west.